However, this relationship of emotional care appears to have been forgotten. Since 1940, the number of bee colonies in the United States has halved from 5 million to ca. 2.5 million. The phenomenon behind these hive losses is called Colony Collapse Disorder (CCD). This blog entry will give a brief overview of CCD, its causes and consequences, how it is being addressed, and what you can do to help. The first documented case attributed to this phenomenon was recorded in 2006 by a professional beekeeper from Pennsylvania, US. After initial disagreement over the causes of CCD, the scientific community reached a consensus in the early 2010s identifying six interconnected drivers of CCD (see table The Six P’s of Colony Collapse Disorder). [7,8] While parasites, pests and pathogens harm the bees themselves, the pesticides used to treat these, and other unwanted organisms, are also detrimental to bees’ health. The threat to smaller bee hives is even bigger as researchers have found a direct correlation between a hive’s level of genetic diversity and its chances of survival. In addition, human activity generally amplifies the above factors, be it through the stress inflicted on commercial hives as they are being transported, the use of pesticides, monocultures, habitat loss, climate change, or consumption patterns. Acarapis Woodi or Varroa Destructor are mites that feed off their hosts’ bodily fluids and spread viruses. These parasites can weaken bees significantly and even cause birth defects. Human beings inflict additional stress on commercial hives as they are transported often and over long distances to pollinate various crops. Will we let bees be next? Overall, collective (national) action has mainly been confined to the realm of research and education with information campaigns from governments, international institutions, NGOs, non-profits and corporations advocating for bee-friendly flowers. [19, 26, 27, 28, 29, 30, 31] Michael Maniates, a professor of social sciences, criticises such DIY problem solving approaches arguing that these a) shift responsibility away from governments and corporations to individuals and b) fail to address the root causes of the issue. Mike Hulme argues that our perception of scientific phenomena, especially those posing a danger to ourselves, are defined by our personal experience and emotions. Thus, personal histories and scientific knowledge are intertwined in shaping our understanding of a problem, which in turn effects our response to it. Going back to the cautionary tale of telling the bees, the scientifically proven interconnectedness of bee keepers’ and their hives’ well-being are highlighted through the emotionally coded practice of ‘telling the bees’. In other words, personal connections and stories lead people to emotionally invest in an issue causing them to care about it and attempt to find ways of improving or even solving it. In ‘telling the bees’, the bee keepers form an emotional connection to their bee hives which in turn inspires them to take (better) care of them. Living, breathing lessons in CCD – ‘Plan Bee’ exhibition at Sydney’s Royal Botanical Garden (photograph by author). Pattullo, A. (2018) Archive Screen Prints[Online]. Available at: http://alicepattullo.com/ARCHIVE-SCREEN-PRINTS/Telling-the-Bees-1 [Accessed: 9 November 2018]. Milius, S. (2018) The mystery of vanishing honeybees is still not definitively solved. Science News 17 January 2018. University of Toronto Libraries. (2018) Telling the Bees [Online]. Available at: https://rpo.library.utoronto.ca/poems/telling-bees [Accessed: 9 November 2018]. Hulme, M. (2009) The Social Meanings of Climate Change. In: Hulme, M. (ed.) Why we disagree about climate change: understanding controversy, inaction and opportunity. Cambridge: Cambridge University Press: 1-34. Stokstad, E. (2007) The Case of the Empty Hives. Science 316(5827): 970-972. Hood, M. (2018) Colony collapse disorder [Online]. Available at: https://www.britannica.com/science/colony-collapse-disorder [Accessed: 9 November 2018]. Okay To Be Smart. (2015) Why Are The Bees Dying? [YouTube]. Available at: https://www.youtube.com/watch?v=rKQNx0av7eY [Accessed: 9 November 2018]. Kurzgesagt – In a Nutshell. (2015) Der Tod der Bienen erklärt – Parasiten, Gift und Menschen [YouTube]. Available at: https://www.youtube.com/watch?v=GqA42M4RtxE [Accessed: 9 November 2018]. 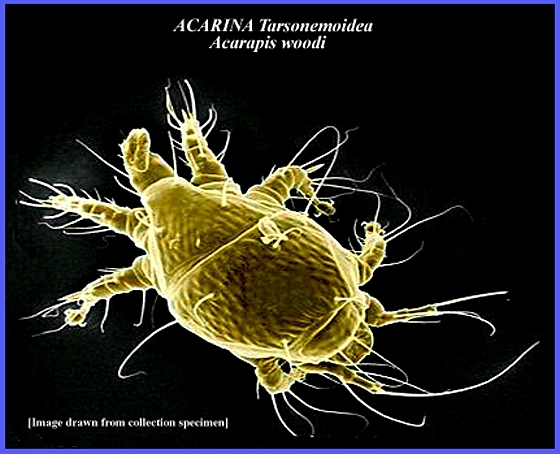 University of California (2018) Acarapis Woodi – Adult Tarsonemoidea [Online]. Available at: http://www.faculty.ucr.edu/~legneref/medical/jpg/Acarapis%20woodi-adult.jpg [Accessed: 9 November 2018]. Bayer AG. (2018). “Varroa Summit” Seeks Coordinated Strategies to Beat Parasite [Online]. Available at: https://beecare.bayer.com/media-center/news/detail/-varroa-summit-seeks-coordinated-strategies-to-beat-parasite [Accessed: 9 November 2018]. Tarpy, D., Van Engelsdrop, D. and Pettis, J. (2013) Genetic diversity affects colony survivorship in commercial bee colonies. Naturwissenschaften 100(8): 723-728. North Carolina State University. (2013) Genetic diversity key to survival of honey bee colonies. Science News Daily 17 June 2013. Ontario Ministry of Agriculture, Food and Rural Affairs (2018) American Foulbrood [Online]. Available at: http://www.omafra.gov.on.ca/english/food/inspection/bees/americanfoulbrood.htm [Accessed: 9 November 2018]. Natural Resources Defence Council. (2011) Why We Need Bees: Nature’s Tiny Workers Put Food on Our Tables. New York: NRDC. WWF. (2018) Living Planet Report 2018: Aiming Higher – Summary. Grooten, M. and Almond, R. (eds.). Gland, Switzerland: WWF. Carman, H. (2011) The Estimated Impact of Bee Colony Collapse Disorder on Almond Pollination Fees. ARE Update 14(5): 9-11. Hiisivuori, L. (2018) In the absence of bees, flies are responsible for pollination in the Arctic [Online]. Available at: https://phys.org/news/2018-10-absence-bees-flies-responsible-pollination.html [Accessed: 9 November 2018]. Cascadian Farm Organic. (2014) A Bee Friendlier Flower Bombing [YouTube]. Available at: https://www.youtube.com/watch?v=3kydE9PW0H8 [Accessed: 9 November 2018]. Berg, K. and Zech, T. (2018) Rettet die Bienen [Online]. Available at: https://www.deutschland.de/de/topic/umwelt/bedrohte-bienen-deutschlands-strategie-fuer-bienenschutz [Accessed: 9 November 2018]. Bundesregierung. (2018) Bienen brauchen unseren Schutz [Online].Available at: https://www.bundesregierung.de/breg-de/aktuelles/bienen-brauchen-unseren-schutz-845920 [Accessed: 9 November 2018]. UNEP (2011) Humans must change behavior to save bees, vital for food production – UN report. UN News10 March 2011. The report also called for further research regarding the effects of genetically modified (GM) crops on pollinators. IBPES. 2016. Summary for policymakers of the Intergovernmental Science-Policy Platform on Biodiversity and Ecosystem Services on pollinators, pollination and food production. S.G. Potts, V. L. Imperatriz-Fonseca, H. T. Ngo, J. C. Biesmeijer, T. D. Breeze, L. V. Dicks, L. A. Garibaldi, R. Hill, J. Settele, A. J. Vanbergen, M. A. Aizen, S. A. Cunningham, C. Eardley, B. M. Freitas, N. Gallai, P. G. Kevan, A. Kovács-Hostyánszki, P. K. Kwapong, J. Li, X. Li, D. J. Martins, G. Nates-Parra, J. S. Pettis, R. Rader, and B. F. Viana (eds.). Bonn, Germany: Secretariat of the Intergovernmental Science-Policy Platform on Biodiversity and Ecosystem Services. Haas, P. M. 1989. Do regimes matter? Epistemic communities and Mediterranean pollution control. International Organization 43: 377–403. Directorate D Natural Capital (2018) The EU approach to tackle pollinator decline[Online]. Available at: http://ec.europa.eu/environment/nature/conservation/species/pollinators/index_en.htm[Accessed: 9 November 2018]. BurtsBeesUK. (2018) #BringBackTheBees [YouTube]. Available at: https://www.youtube.com/watch?v=T05FDxZJ4bs [Accessed: 9 November 2018]. BurtsBeesUK. (2018) Bring Back The Bees: Flower Shop [YouTube]. Available at: https://www.youtube.com/watch?v=0AeYE6a4KVE [Accessed: 9 November 2018]. General Mills Inc. (2018) #BringBackTheBees [Online]. Available at: https://bringbackthebees.ca/#a [Accessed: 9 November 2018]. General Mills. (2018) #BringBackTheBees is Back! [Online]. Available at: https://www.cheerios.com/bring-back-the-bees/ [Accessed: 9 November 2018]. TheEllenShow. (2018) #BeeKind with Beth Behrs: Bee-Friendly Tips [YouTube]. Availbale at: https://www.youtube.com/watch?v=jOqAuNfw5Qc [Accessed: 9 November 2018]. Cascadian Farm Organic. (2018) Bees Need Our Help [Online]. Available at: https://www.bee-friendlier.com [Accessed: 9 November 2018]. Maniates, M. F. (2001) Individualization: Plant a Tree, Buy a Bike, Safe the World? Global Environmental Politics 1: 31-52.